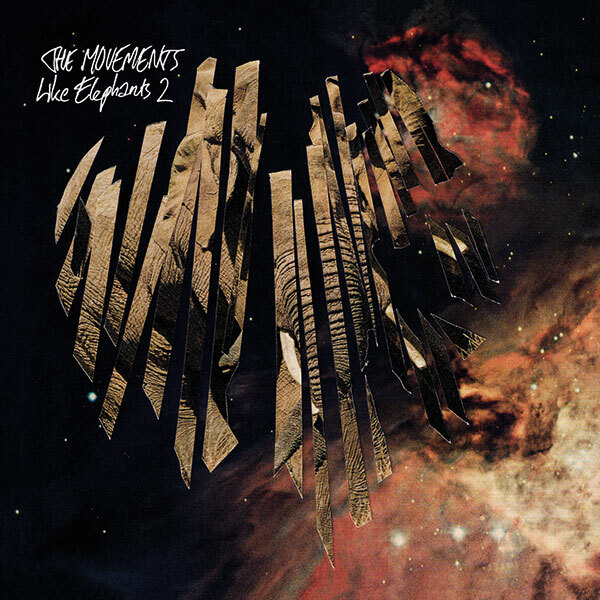 Less than a year after releasing Like Elephants I (reviewed separately), The Movements came back with 2014′s Like Elephants II. And the two discs truly are of a piece: sonically related, thematically linked. In fact, with a combined run time of just shy of 80 minutes, The Movements could have combined the entire work onto a single disc. But having done so would have overstuffed the resulting work: by the time one got to the material that comprises Like Elephants II, that music’s charms might not get the attention and appreciation they deserve. The reverbed guitar lines that accent “Six Feet Under” give the tune an epic, cinematic feel; the tom-heavy drum work creates a feeling of anticipation, and the George Harrison-styled slide guitar (often in unison with single-note organ lines) fits perfectly. “Stolen Love” delivers on the promise of more minor-key psych-pop. “Icecold” is a companion piece to Like Elephants I‘s “Shady Wind.” The insistent beat of “Give it to Me” heightens the tension quotient. “Everybody Needs Something” is space rock a la Nektar; notes are often left hanging in the air, and the spaces between them creates drama. It’s a sort of Shadow Morton meets The Lords of the New Church, with psychedelic guitar for extra effect. And after all that, a comedown is necessary: “Redemption” serves that purpose expertly. Its deliberate pace is adorned with keening pedal steel, gentle electric piano and a fragile lead vocal. With that song’s countrified feel fresh in your mind, the mania of “Yesterday, Now and Forever” feels like cowpunk crossed with psych rock: space cowboy music, perhaps? “Like Elephants II” has little in common with the previous disc’s title track; the droning organ sounds more like a harmonium here, and the ghostly guitar accents take on a vaguely North African feel. But then it’s back to hypnotic guitar pop, with densely layered vocal harmonies for “Winter’s Calling.” An extended vamp provides a sympathetic bed upon which the band adds an extended, wah-wah guitar solo. As the track unfolds, the arrangement heads father toward the outer reaches of psychedelia, with what one might call structured jamming. Like Elephants II closes in similar fashion to its companion disc. “What Would Happen If I Tried” rewards those who’ve hung on for the full ride. Heavily distorted organ lines are joined by acoustic guitars and hand-held percussion. A vulnerable lead vocal enters, joined by swooning guitar figures, all atop a simple, two-chord foundation. The instruments fade, leaving behind a heavily echoed repeat of the the song’s title. I remember how pleased I was when I discovered Porcupine Tree around the time of the release of Fear of a Blank Planet: not only was that a great album, but the band already had a catalog nearly two dozen discs deep. So I had a lot of digging to to, and greatly enjoyed nearly all of it. I’m equally intrigued to explore The Movements’ back catalog, a collection of four or so albums dating back to 2009. It will be interesting to hear if the sound as presented on Like Elephants is present on their earlier work, or if the current approach is one they grew into. Meanwhile, look for Like Elephants I and II on my Best of 2014 lists, coming in late December.